In 1868 the Broadway blocks just north of Union Square were quickly becoming the main shopping district of Manhattan. Wide brick homes were rapidly being replaced by retail emporiums and that year the well-known merchant Edwin Hoyt, a partner in Hoyt, Spragues & Co., commissioned architect Griffith Thomas to design an imposing store at the northwest corner of 18th Street and Broadway. On the north end of the block retailer Arnold, Constable & Co. planned a second store to supplement its white marble Canal Street location. Whether by coincidence or not, Griffith Thomas was given the task of designing this building as well. The result would be two architecturally harmonious structures that visually flowed together as one. 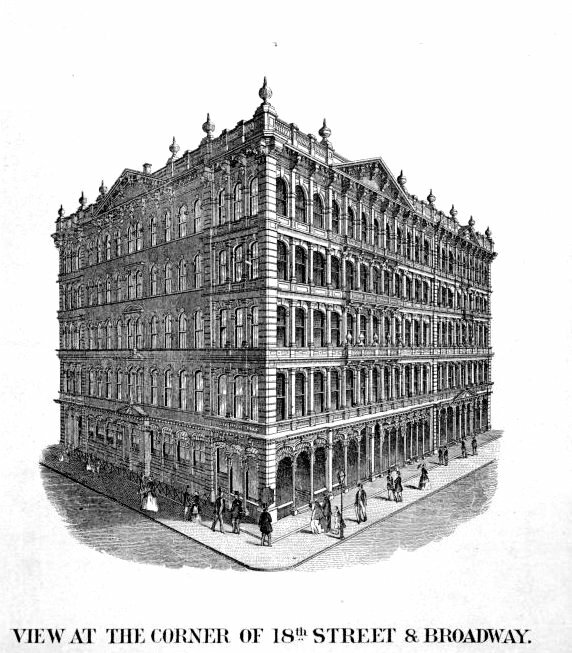 The well-dressed shoppers of New York’s carriage trade would enter a five-story Second Empire Commercial-style building clad in rose-colored marble. A delicate street-level arcade supported ranks of arched openings separated by pilasters and columns. During the last quarter of the 19th century the popular Aesthetic Movement swept the country and every up-to-date household boasted an Asian-themed nook or room. A. Vantine & Co., which called itself “The Oriental Store,” sold exotic gifts such as Chinese porcelains, lacquered ware, Turkish rugs and colorful Japanese lanterns. 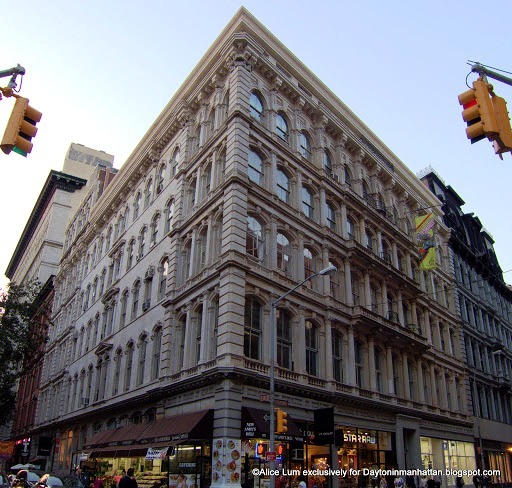 The firm shared space with Aitken, Son beginning in 1887, when the Hoyt Building became essentially two separate, equal-sized stores. A year later owner Solomon Loeb contracted architectural firm Delemos & Cordes to enlarge the two buildings. The northern structure at mid-block was extended backwards, to the west and south, creating an L around the corner building which was simultaneously extended 23 feet along 18th Street 23 feet. The nearly seamless extensions, clad in marble, closely matched Thomas’s design; although they exceeded the height of the original building by three stories. Following Loeb’s death the owner of A. Vantine & Co. purchased the building. On November 25, 1905 The Real Estate Record and Builders’ Guide noted that Irving C. Raymond had hired architect Thomas H. Styles to “add 1 story, alter windows, elevator, stairs” to Nos. 873-879 Broadway at a cost of $15,000. Unlike Delemos & Cordes’ alterations, this would not be so architecturally-sympathetic. The decorative triangular pediments, balustrades and bulbous finials were replaced by a nearly-industrial looking addition. The new top story resulted in an unexpected scandal. Not only was added floor not fireproof, it was 18 feet higher than the application filed by the architect. A Special Examination of the Accounts and Methods of the Office of the President of the Borough of Manhattan was ordered by Mayor George B. McClellan to look into the possibility of graft. Raymond’s addition was closely reviewed. Testimony in the hearings revealed the a mason employed in the alteration, George Potterton, stated that a “payment of money” would secure the approval of the additional story by the Bureau of Buildings. Building Superintendent Murphy found himself in hot water over his acceptance of bribes. “This seems to us to be so gross a misuse of discretionary power as to constitute an unfitness for office,” the Report concluded. In February 1912 A. A. Vantine & Co. leased the entire building at Nos 436-468 5th Avenue and moved in with its companion firm, Aitken Company, leaving the marble building on Broadway that had been their home for decades. The Hoyt Building now filled with a variety of smaller tenants, many of them manufacturers. While the Sitt & Howell Company was selling rugs and carpeting from the first floor retail area, Gottschalk, Dreyfuss & Davis, Inc. moved here from No. 45 East 20th Street in January 1916. The wholesale manufacturer printed “hand-painted, die-stamped, offset and lithographed cards” which were sold to stationers. Through the 1920s the trend continued. Fishbein & McCabe, leather goods manufacturers, moved here in 1920. A year later Valkone Dye & Finishing Works took an entire floor. For years, beginning around this time, Moe Levy & Son would sell men’s clothing from here. On the corner, from 1920 through 1951 a bank leased the corner space at street level. In the second half of the century offices on the upper floors became headquarters to the Socialist Workers Party. Here the leader of the Trotskyite Communist Party planned his Presidential campaign and other Socialist members ran for various offices. What would seem to be a mere rental agreement proved dangerous to the building. In 1966 Socialist Judy White was running for Governor of New York and Richard Garza was seeking the office of Lieutenant Governor. On September 29 four bombs exploded at the headquarters, “causing extensive damage,” according to The New York Times. Three years later Paul Boutelle was a candidate for Mayor. On April 24, 1969 15 workers inside the headquarters at No. 873 Broadway were visible from the street. A hand grenade was tossed at the closed window. It bounced off the glass and demolished a parked car. Although the graceful arcade that once graced the first floor has been long-demolished, the rest of the Hoyt Building has been little changed since the 1905 renovation. The middle four floors still blend harmoniously into the old Arnold, Constable & Co. department store, providing a glimpse back to the days of the post-Civil War shopping district. Herter Brothers furniture makers moved into the building in 1869. They used their proximity to Arnold, Constable & Co. in their advertising. Your blog is great!